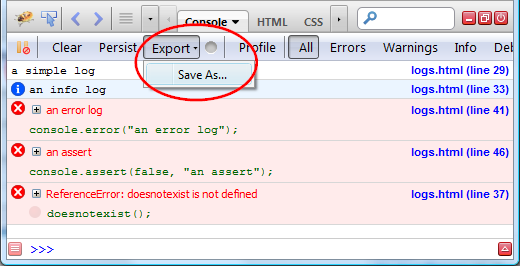 Here is the UI that appears in Firebug after ConsoleExport is installed in your Firefox. Since most of the details about manual export is already available on the home page let's focus on auto-export where all logs are sent to the server as XML packets. There are two ways how to activate/deactivate auto-export. You can use Firebug UI and click the little circle next to the Export button. In case of automated scenarios (e.g. when Selenium is integrated) you can just set a preference (this is essentially what the button does). Now you need to specify server URL where to send the logs (XML packets). This is done through another preference. Here is an example server side script (PHP) that receives XML packets and stores them into consoleexport.log file. You can also read detailed packet description.